1. What's your name and blogger name? 2. What your blog's URL? 8. Tag bloggers to participate. I tag Marta Writes and Angie in Pink (who was my handwriting idol even since I was 8) but I'm not sure either of them read my blog. If you do, holler at me! Your handwriting is awesome. You should totally make a font out of it. Or I could try to do it. Either way, I think it's worth sharing (plus then you could incorporate it into your blog). I've always been secretly jealous of your handwriting! It is PERFECT! You really should make a font out of it! oh, my goodness, i feel so honored. :) thanks! you have had impeccable handwriting since day 1, liz. seriously. ps: your william is DARLING. One of my favorite things in college was seeing your sweet handwriting the little white board in the kitchen. and P.S. I've been addicted to Sweet Disposition ever since you burned me that mix cd! aw! i'm seriously going to cry. it's so so so beautiful! please make a font. Gosh, it never occured to me to practice handwriting! 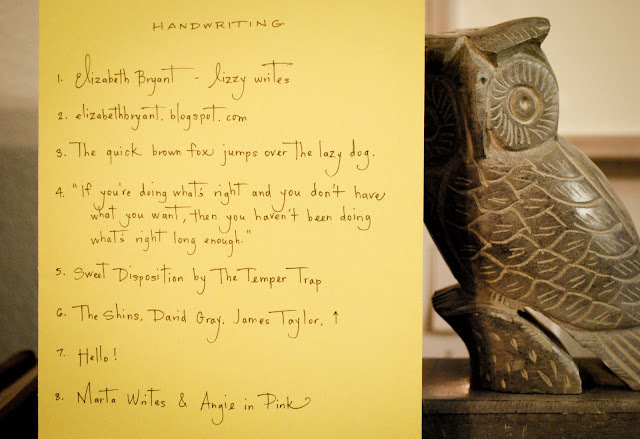 You mean, you and Angie don't have insanely adorable, font-worthy handwriting just by cosmic accident? I wonder if it's too late to start! I like my handwriting when I focus on it...which is not very often. i've always loved handwriting. and yours? i LOVE it. agreed - make a font! I was TOTALLY obsessed with mt handwriting in jr high too! But that was before texting and facebook so handwritten notes were a MUST! I too practiced EVERY chance I got! And when I would get bored I would switch up how I wrote my A's, S's, E's, T's and F's.I think I had great handwriting, but like you said I haven't really had to write much in the last 8 years. I practice before making cards and I always get frsutrated because it doesn't come naturally anymore. :( I wonder what our kids will be doing in school... will they have electronic tablets they learn to write on instead of paper? I LOVe looking back at my journal to see how I changed my handwriting and how it improved over the years. Now I type my journal entries... maybe I should write them again for posterity sake? p.s. - this blogger will turn handwriting into fonts for free! you should do it! I heart yours and would LOVE to download it!!! hello lizzy.. your handwriting is beautiful and i love this idea!! thank you for tagging me. i'm definitely going to play along.. once i get back from spring break. thank you, thank you. I remember very specifically at mutual long ago (I was a beehive) you mentioning how you practiced your handwriting. I remember thinking something to the effect of, "Wow! Looks like nothing in life is free. She must have some amazing will power to just write over and over again." I gave it a go here and there but I got bored of it and couldn't decide on how to write my E's and Y's. They still keep changing them and both are in my name! Anywho! lovely handwriting! You deserve the recognition for all that time you must've put in to it! please do me a favor and give me your handwriting. i love it!